Here you can see a cluster of Giant Sequoias in Giant Forest. They only grow in the western Sierra Nevada Mountains in very damp ground between 6000 and 7000 feet elevation. 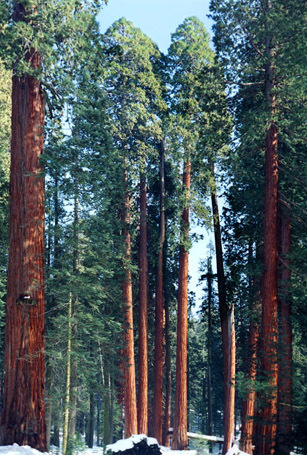 The largest living thing on our planet is a Giant Sequoia. It has branches which contain more wood than many normal trees. Indeed, you could build a nice house from just one branch! Oh, by the way, do you know of any words in the English language which contain all five vowels?